WATCH: Ellie Downie fell during her uneven bars routine. Ouch! 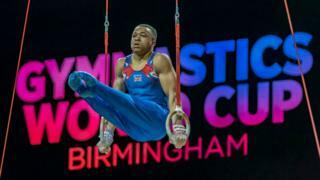 Things didn't go to plan for the team from Great Britain at the Gymnastics World Cup, with both Ellie Downie and Joe Fraser missing out on medals. Eighteen gymnasts took part in the All-Around World Cup Series event on Saturday in Birmingham's Genting Arena. Ellie started off well, scoring 14.3 in the vault to sit second after the first of six events, but then fell twice on the bars and once on the beam, costing her points. Thankfully she was ok and was able to get back up and carry on with her routine, but was understandably disappointed. Guide: Who is Simone Biles? Think you know about gymnastics? Of course you do - but how much? Test yourself with our quiz. In the end Ellie Downie finished seventh, with an all-around score of 49.333. Despite her difficulties she showed good composure, and was backed by the home crowd. Afterwards she said: "The crowd were amazing! 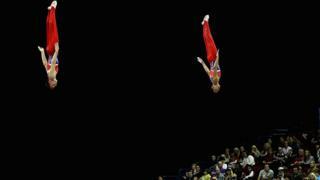 When I put my arm up for vault I was like 'wow'! The crowd were insane, and I think that's what got me through today." "It was quite tough for me today," she added. "I definitely could have put in a better performance, but it was a heavy week for me after the British last weekend." The 19-year-old was crowned British champion last week, and will be looking to retain her European title in Poland next month. Her GB teammate Joe Fraser missed out on a men's medal by half a point, but said he'd "really enjoyed" the competition. Speaking to BBC Sport he said: "[It's] my first major competition in Birmingham - my home city. After the pommel horse, which was tricky, it got easier and easier from there. Jamie Lewis, who was only called up during the middle of last week, finished ninth overall. He replaced Commonwealth Games champion Nile Wilson, who missed the competition following surgery for an ongoing neck issue. What is the Gymnastics World Cup? It's part of bigger competition called the World Cup Series, which also holds other events in cities around the world. Gymnasts will also head to Melbourne in Australia, Baku in Azerbaijan, Doha in Qatar, and Cottbus in Germany to earn points towards qualifying for the Olympics. This competition took place at Birmingham's Genting Arena, with nine male gymnasts and nine female gymnasts showing off their flair, strength, stamina, grace and composure. The men competed in pommel horse, floor, rings, vault, parallel bars and high bar, while the women focused on beam, vault, floor and uneven bars. The competitors, who are representing eight different countries, were fighting to take home the prestigious titles. Who were the big winners? Aliya Mustafina of Russia won the women's event with 53.56. Her only error came on beam where she also had a fall. Riley McCusker from America took the silver, and Thais Fidelis from Brazil the bronze. 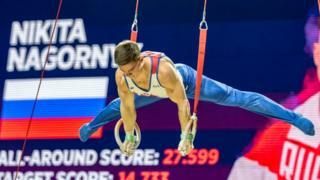 Russian star Nikita Nagornyy took gold, wowing the crowd. Wei Sun from China took silver and Japan's Kazuma Kaya secured bronze. What are the Special Olympics 2019?